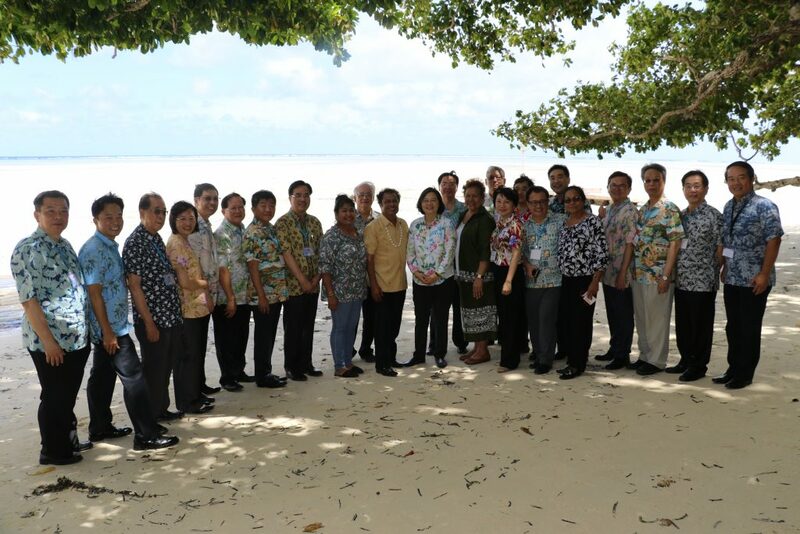 President Tommy E. Remengesau, Jr. and First Lady Debbie M. Remengesau accompanied by Palau’s Cabinet Ministers hosted President Tsai Ing-wen and members of her delegation at their beach house in Choll, Ngaraard State on Friday, March 22, the second day of President Tsai’s State Visit to Palau. President Tsai who was accompanied by Secretary-General David Ta-wei Lee of the National Security Council, Minister Joseph Wu of the Foreign Affairs Ministry, Minister Shih-Chung Chen of the Health & Welfare Ministry, Minister Icyang Parod of the Council of Indigenous Peoples, Legislator Chao-Hao Liu of the Legislative Yuan, Deputy Secretary Ming-yen Tsai of the National Security Council, and Deputy Minister & Director-General Kuo-En Chen of Coast Guard Administration, Ocean Affairs Council enjoyed a quiet lunch on the beach complete with local delicacies such as demok (taro leaf soup), fruit bat soup, steamed mangrove crabs, and belsiich (pounded taro). President Remengesau who earlier received President Tsai’s courtesy call at the Office of the President at the Capitol Building in Ngerulmud, expressed Palau’s appreciation of the Republic of China-Taiwan partnership and reaffirmed the special friendship and relations both countries have shared over the past 20 years. President Remengesau and President Tsai are scheduled to observe a brief Coast Guard rescue operation as well as visit Nikko Bay and Dolphins Pacific on March 23.